I've officially finished working at the preschool, I have two interviews lined up for this week (second interviews!) so I'm going to take advantage of this time off by being productive and enjoying some freedom from the weekly grind! I want to post my menu for the week again and see if I can make it happen this week!! 26:3 "For your steadfast love is before my eyes, and I walk in your faithfulness." 28:7 "The Lord is my strength and my shield; in Him my heart trusts, and I am helped; my heart exults, and with my song I give thanks to Him." 30:1 "I will extol You, O Lord, for you have drawn me up and have not let my foes rejoice over me." If you're the praying kind, I'd appreciate prayers of peace for this week! I know the Lord has me and He has a perfect plan for where I'm supposed to be! But going to interviews can still be nerve wracking. Pray that I fully put my trust and hope in Jesus this week and always! Happy Monday, have a fabulous week my friends! P.S. Don't forget to check out this LINK! Awesome movie coming out soon. So cute! Glad I found your blog through the Facebook blogger page. I LOVE your wedges in the graduation pic! Hope you can stop by sometime! Praying for you and the interviews this week. You'll nail them! Oh thanks for sharing! 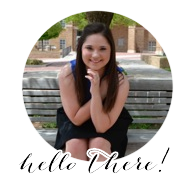 Found your blog through the Texas Women Bloggers and it is adorable :) I will be praying for you!